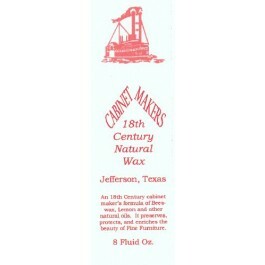 CABINETMAKERS WAX 8 oz bottle 18th Century formula of Beeswax, Lemon and other natural oils. It preserves, protects, and enriches the beauty of fine furniture, clocks and woodwork. Use a little on your dust rag and it will help repel dust. Contains no silicones, detergents, alcohol, turpentine, varnishes, stains, dyes, or any other flammable chemicals. A nice clean smell and will not cause wax buildup. If you have a cloudy finish on your furniture from using a silicone based wax it will over time return the luster to your furniture.